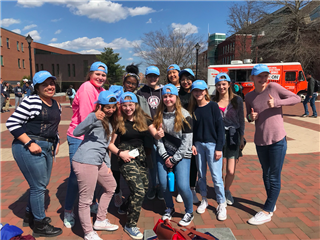 This annual conference has been held for eighth grade girls for the past 25 years and encourages them to pursue opportunities in STEM fields. 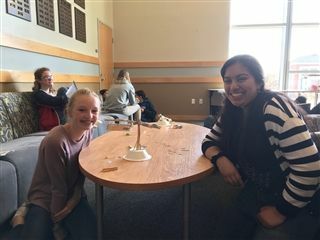 The girls spent the day with fantastic female STEM role models from the UConn School of Engineering Undergraduate Program. It was a day of inspiration for the young ladies as they prepare to make choices regarding their studies and careers the future. Each student attended two of the following workshop sessions. The workshops were designed to acquaint students with applications of engineering, math, science, and technology in the real world. “Candylever Challenge:” Students used a variety of materials to design and build a cantilever beam. The challenge was to design and build the longest overhanging structure which supports a 100 g mass suspended at the far end. “Chocolate Asphalt:” Students used a variety of materials to produce asphalt pavement. There are many similarities between melted chocolate mixed with dry ingredients and real asphalt. The melted chocolate represented the binder and the candies represented the aggregates. “Rocket Car:” In this workshop the students created a rocket car with a balloon as a motor. They then tested their design and competed in the UConn 500. “Gack and Diapers:” In this station the students explored the chemistry of polymer science. They reverse engineered a diaper and then cross-linked a polymer and observed the changes in the physical properties as a result of this cross-linking. “Electricity and Magnetism:” Students replicated Hans Oersted’s famous discovery of electromagnetism in 1820 and then built a working electric motor. Lenz’s Law, along with a number of other electricity and magnetism activities, were also demonstrated. “Harness the Wind:” Students learned the importance of wind power. They created a turbine blade and made their own windmill. Student turbines were then tested for performance to determine how much energy it actually converted. “Next Dimension:” Students learned that 3D printing is the future of manufacturing. 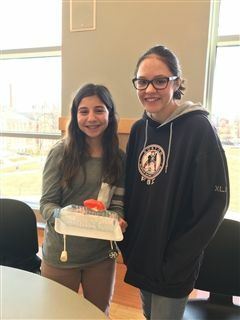 The girls were able to take home a project made from UConn’s 3D printer. The afternoon was spent attending two sessions called “Tool Clues.” Conference leaders brought in five objects or tools from their work place that gave clues as to what they do for a living, and then students guessed their profession based on the clues. "The girls learned a lot about the jobs that are available to them after college," Carrie shared. "It definitely got them thinking about the many opportunities within the STEM fields. We all had a great time!"